Many readers of the Book of Mormon naturally assume that Joseph Smith translated its books in the order that we find them today, that is, beginning with Title Page, and then translating 1 Nephi 1:1 through Moroni 10:34. 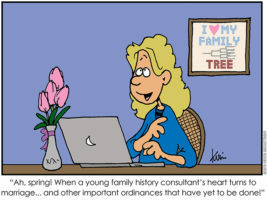 It may be surprising to learn that the books from the Small Plates of Nephi (1 Nephi through Words of Mormon) almost certainly came last in the translation process, after the completion of Mormon’s abridgment of the Large Plates of Nephi (Mosiah through 4 Nephi), followed by the books of Mormon, Ether, Moroni, and the Title Page. This explains why the books from the Small Plates would show up last, rather than first in the translation process—that was their order on the plates themselves. When it came time to publish the Book of Mormon, Joseph and Oliver moved the transcription of Nephi’s Small Plates to the beginning of the text, where it provided an ideal starting point and replacement for the lost book of Lehi. 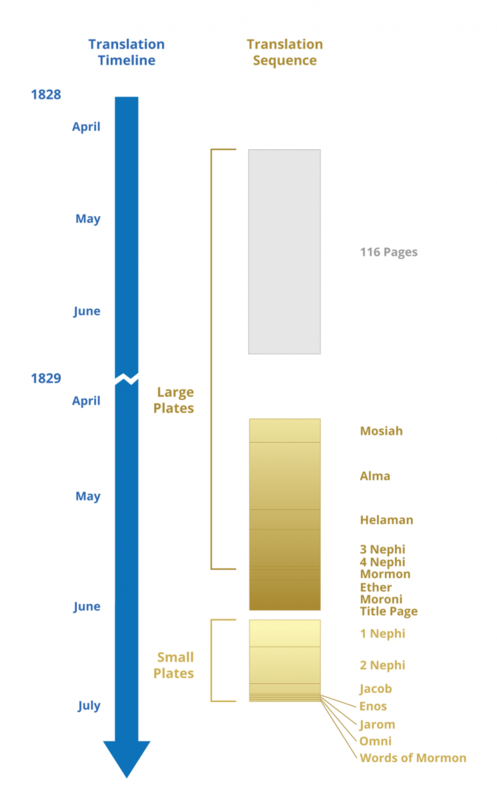 This chart depicts how after the 116 pages were lost, Joseph Smith translated from Mosiah to Moroni before returning to translate the small plates. Image by Book of Mormon Central. This order of translation, commonly called the “Mosiah-First” theory or sequence, is strongly supported by multiple lines of evidence and is now favored by a solid scholarly consensus.7 Besides making clear sense of the manuscript and historical data, this understanding of the translation sequence also provides fascinating and somewhat unexpected evidence for the Book of Mormon’s authenticity. This is because many passages from Mormon’s abridgment of the Large Plates, as well as from the books of Mormon, Etherand Moroni, refer back to content from the Small Plates, even though the Small Plates hadn’t even been translated yet! 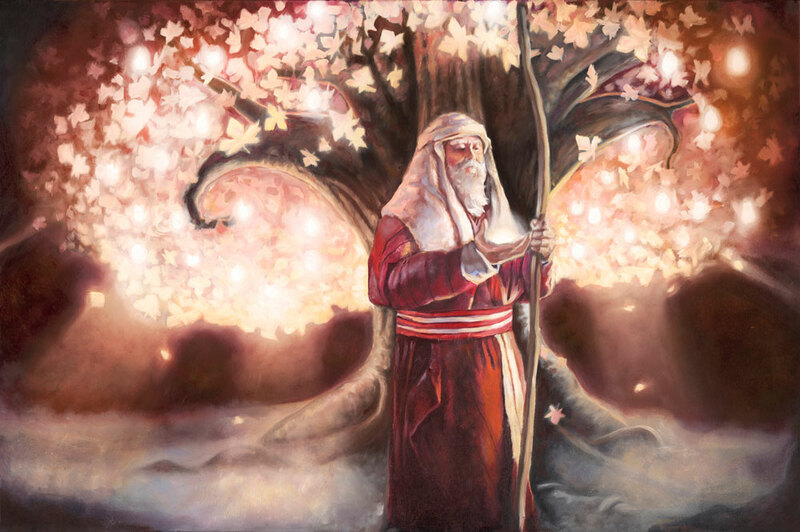 For instance, in Alma 36:22 Alma says that he thought he saw God even as Lehi had seen Him, “sitting upon his throne, surrounded with numberless concourses of angels, in the attitude of singing and praising their God.” Those words are a direct quote from the prophet Lehi found in 1 Nephi 1:8. Into the Light by Lehi Sanchez. Submitted to Book of Mormon Central’s 2018 Art Contest. These relatively frequent allusions and references back to earlier textual strata make complete sense if the Book of Mormon is truly what it claims to be. Mormon, Alma, and other later prophets would have had Lehi’s and Nephi’s earlier writings to refer to and quote from.11 On the other hand, these allusions are difficult to explain if Joseph was simply making up the Book of Mormon’s content, as some have supposed. Under the theory that Joseph composed (rather than translated) the text, he would have needed to make many detailed references back to passages that he hadn’t yet created. Not only that, but according to the eyewitnesses to the translation, he would have had to create and then remember all these references in a fast-paced translation setting, without any working notes or reference materials to aid his memory.12 And then, he would have needed, in composing the Small Plates last, to remember to accurately create the earlier layer of texts that later prophets had already referred and alluded to. John W. Welch, “The Miraculous Timing of the Translation of the Book of Mormon,” in Opening the Heavens: Accounts of Divine Manifestations, 1820–1844, ed. John W. Welch, 2nd edition (Salt Lake City and Provo, UT: Deseret Book and BYU Press, 2017), 121–125; for a detailed discussion of the Mosiah-first translation theory, see the 1st edition, 2005, 115–117). Alan Goff, “Positivism and the Priority of Ideology in Mosiah-First Theories of Book of Mormon Production,” FARMS Review 16, no. 1 (2004): 11–36. 1.See Book of Mormon Central, “What if Martin Harris Didn’t Lose all of the 116 Pages? (Words of Mormon 1:18),” KnoWhy 331 (June 26, 2017). 2.In not retranslating the Book of Lehi, Joseph adhered to a revelation given to him by the Lord which warned that wicked men would use the retranslation to “destroy the work of God” (see Doctrine and Covenants 10:23). 3.See John W. Welch, “Doubled, Sealed, Witnessed Documents: From the Ancient World to the Book of Mormon,” in Mormons, Scripture, and the Ancient World: Studies in Honor of John L. Sorenson, ed. 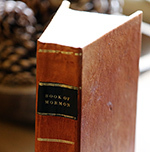 Davis Bitton (Provo, UT: FARMS, 1998), 391–444; Book of Mormon Central, “Why Would a Book Be Sealed? (2 Nephi 27:10),” KnoWhy 53 (March 14, 2016). 4.See 1 Nephi 1:16; 6:3; 8:29; 9:1. See also, S. Kent Brown, “Nephi’s Use of Lehi’s Record,” in Rediscovering the Book of Mormon: Insights You May Have Missed Before, ed. John L. Sorenson and Melvin J. Thorne (Salt Lake City and Provo, UT: Deseret Book and FARMS, 1991), 3–14; S. Kent Brown, “Recovering the Missing Record of Lehi,” in From Jerusalem to Zarahemla: Literary and Historical Studies of the Book of Mormon (Provo, UT: Religious Studies Center, Brigham Young University, 1998), 28–54. 5.See David E. Sloan, “The Book of Lehi and the Plates of Lehi,” in Pressing Forward with the Book of Mormon: The FARMS Updates of the 1990s, ed. John W. Welch and Melvin J. Thorne (Provo, UT: FARMS, 1999), 59–62. 6.See Book of Mormon Central, “Why is ‘Words of Mormon’ at the End of the Small Plates? (Words of Mormon 1:3),” KnoWhy 78 (April 14, 2016). 7.See John W. Welch, “Timing the Translation of the Book of Mormon: ‘Days [and Hours] Never to Be Forgotten’,” BYU Studies Quarterly 57, no. 4 (2018): 22–23; John W. Welch, “The Miraculous Timing of the Translation of the Book of Mormon,” in Opening the Heavens: Accounts of Divine Manifestations, 1820–1844, ed. John W. Welch, 1st edition (Salt Lake City and Provo, UT: Deseret Book and BYU Press, 2005), 115–117. 8.This connection is developed in Alan Goff, “Positivism and the Priority of Ideology in Mosiah-First Theories of Book of Mormon Production,” FARMS Review 16, no. 1 (2004): 31–32. 9.See Goff, “Positivism and the Priority,” 32–33. 10.See Goff, “Positivism and the Priority,” 30–31. 11.See Steven L. Olsen, “Prophecy and History: Structuring the Abridgment of the Nephite Records,” Journal of Book of Mormon Studies 15, no. 1 (2006): 18–29, 70–71; Steven L. Olsen, “Prospering in the Land of Promise,” FARMS Review 22, no. 1 (2010): 229–232; Book of Mormon Central, “How Is Prosperity Defined in Nephi’s Small Plates? (Words of Mormon 1:6),” KnoWhy 383 (November 21, 2017). 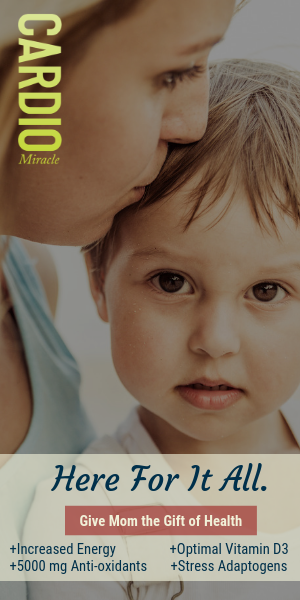 12.See Book of Mormon Central, “Why Did the Book of Mormon Come Forth as a Miracle? (2 Nephi 27:23),” KnoWhy 273 (February 10, 2017); Book of Mormon Central, “How Did Emma Smith Help Bring Forth the Book of Mormon? (2 Nephi 27:6),” KnoWhy 386 (November 30, 2017); John W. Welch, “The Miraculous Timing of the Translation of the Book of Mormon,” in Opening the Heavens: Accounts of Divine Manifestations, 1820–1844, ed. John W. Welch, 2nd edition (Salt Lake City and Provo, UT: Deseret Book and BYU Press, 2017), 168. 13.See Goff, “Positivism and the Priority,” 33. 14.See Olsen, “Prophecy and History,” 18–29, 70–71; Book of Mormon Central, “How Does Prophecy Shape the Book of Mormon’s Content and Structure? (Words of Mormon 1:4),” KnoWhy 498 (January 15, 2009). 15.For information about Joseph Smith’s education, see Book of Mormon Central, “Why Would God Use an Uneducated Man to Translate the Book of Mormon? (2 Nephi 27:19),” KnoWhy 397 (January 9, 2017). For analysis of Joseph Smith’s literary abilities at the time of the translation, see Robert A. Rees, “Joseph Smith, the Book of Mormon, and the American Renaissance,” Dialogue: A Journal of Mormon Thought 35, no. 3 (2002): 83–112; Robert A. Rees, “Joseph Smith, the Book of Mormon, and the American Renaissance: An Update,” Interpreter: A Journal of Mormon Scripture 19 (2016): 1–16; Robert A. Rees, “John Milton, Joseph Smith, and the Book of Mormon,” BYU Studies Quarterly 54, no. 3 (2015): 6–18. 16.See Book of Mormon Central, “Evidence of the Book of Mormon: Internal Complexity,” online at bookofmormoncentral.org; Melvin J. Thorne, “Complexity, Consistency, Ignorance, and Probabilities,” in Book of Mormon Authorship Revisited: The Evidence for Ancient Origins, ed. Noel B. Reynolds (Provo, UT: FARMS, 1997), 179–193; John W. Welch, “Textual Consistency,” in Reexploring the Book of Mormon: A Decade of New Research, ed. John W. Welch (Salt Lake City and Provo, UT: Deseret Book and FARMS, 1992), 21–23; Book of Mormon Central, “How Does Prophecy Shape the Book of Mormon’s Content and Structure? (Words of Mormon 1:4),” KnoWhy 498 (January 15, 2019). 17.See Michael Hubbard MacKay and Gerrit J. Dirkmaat, “Firsthand Witness Accounts of the Translation Process,” in The Coming Forth of the Book of Mormon: A Marvelous Work and a Wonder, ed. Dennis L. Largey, Andrew H. Hedges, John Hilton III, and Kerry Hull (Salt Lake City and Provo, UT: Deseret Book and Religious Studies Center, Brigham Young University, 2015), 63. 18.While the chart in this appendix presents many references and allusions back to the Small Plates, it should not be viewed as final or complete. Much work remains to be done in tracking down all possible intertextual relationships between the Small Plates and later prophetic writings in the Book of Mormon. 19.Matthew L. Bowen, “‘He Is a Good Man’: The Fulfillment of Helaman 5:6–7 in Helaman 8:7 and 11:18–19,” Interpreter: A Journal of Mormon Scripture 17 (2016): 167–168; Book of Mormon Central, “What Is So Good about Nephi’s Name? (1 Nephi 1:1),” KnoWhy 445 (June 28, 2018). 20.See Matthew L. Bowen, “Nephi’s Good Inclusio,” Interpreter: A Journal of Mormon Scripture 17 (2016): 181–195. This is fascinating from a personal perspective of the Prophet Joseph. One can only imagine the feelings he had as the lost stories were the very last to be translated, and the trying and confirming of his faith as the book all came together. Thanks for these insights!